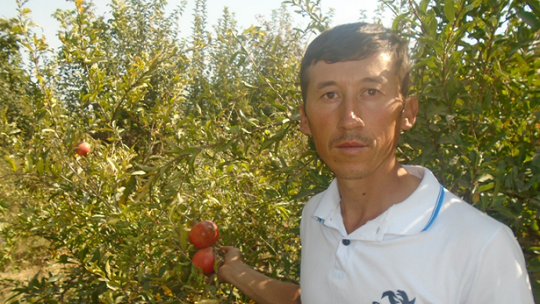 Jamshid Kuzimuratov lives in Sughd region, Spitamen district, Farmonkurgon village. He is 32 years, married and has two children. Jamshid has been engaged in fruit-growing and crop production for 15 years, with the help of his wife. Before having access to microloans, Jamshid had 0.05 hectares of leased land. After he began working with the microfinance institution HUMO, his land expanded by 2.5 hectares, on which he sowed onions and melons. In addition, he was able to expand the garden of pomegranates, figs and got a good harvest. With his savings, he also managed to improve his quality of life by buying a car. Jamshid is currently in his third lending cycle with HUMO. He is a responsible and honest person; he always repays his loans on time. "By supporting my loan, you created me opportunity to turn my dreams into reality. I am very grateful to you for this", - says Jamshid to MicroWorld’s lenders and HUMO.